Rahima Begum, a young woman in the village of Kaligonj in the northwest of Bangladesh, turned down the romantic advances of a neighbour and paid dearly for it. In the dead of night, while she was asleep, her neighbour poured acid over her face, leaving her disfigured for life. "I may be still alive but he took my life away, I have become the shame of my family and of my village. I have no where to go," she says. According to official figures, there are only around 200 acid-related crimes reported every year in Bangladesh. However, thousands of acid-attack victims find refuge at the Acid Survivor Foundation (ASF) in Dhaka, the capital, in any given year. Like Rahima, most victims are women who have spurned advances from men. "The perpetrators have a strong mindset not to kill the person but to put the victim in a position that they suffer for life," Monira Rahman, the ASF's executive director, said. The effect is to rob a woman of her beauty, thus ensuring that she will never be admired again, she said. The survivors of these assaults suffer deep burns and most bear irreparable scars for the rest of their lives. Some disfigurement can be treated through surgery, however. Dr Ronald Hiles, a retired plastic surgeon from the UK, has spent his last two summers volunteering at the ASF, where he has been operating on victims of acid attacks and training Bangladeshi doctors in reconstructive surgery. "The devastation that acid causes is really similar to the devastation from electricity, from alkaline, from flames or from hot water. Acid usually burns right through the skin," Hiles said. The Bangladeshi government takes acid crime very seriously, and in the past decade has enacted many laws aimed at curbing the occurrence of this crime. In 2002, legislation was enacted to restrict civilian access to the lethal substance. This is an effective measure, but has not been adequately enforced. Acid is still accessible to the public, and can be purchased by the gallon for less than $3 at shops that sell industrial chemicals. The Bangladeshi authorities have also stated that all acid related crimes will be tried within six months under a special tribunal. John Morrisson, the founder of the Acid Survivor Trust International, an advocacy group, welcomed the move made by the government, but warns that a great many cases continue to go unreported. "We started to collect our figures, and the more we collected, the more serious was the problem. The number of acid attacks started to increase and we could see that by 2002 there were 500 attacks a year and that the numbers were growing," said Morrisson. Eight-year-old Babli was attacked by her own father when she was only an infant. He had purchased acid from a local shop and then poured it into his daughter's ears and over her feet. Her mother Ayeesha explains that he was angry that she had been born a girl. Despite the government's promises to take these cases seriously, Babli and her mother have little hope of seeing justice done. An arrest warrant was issued against Babli's father in 2002, but the police have still not taken action. Ayeesha believes that her husband has been bribing the local police for the last five years in order to ward off arrest. Rahman of ASF believes that such police inaction shows how deep the culture of impunity is in relation to acid attacks. "Because of the impunity, the perpetrators are not punished," she said. "This could encourage other potential perpetrators who have the mindset to do this. It is important to have the education to change the mind set of men." In May 2008, ASF organised a march for Men Against Acid Attack, the first of its kind in Bangladesh. 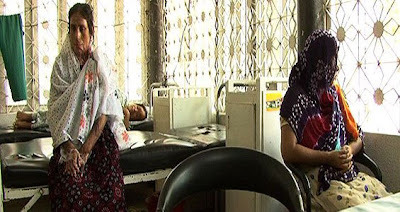 Still, acid attacks remain a common crime in Bangladesh. Until the law is enforced and people's behaviour begins to change, women will continue to be at risk, and cases like Babli's will remain unpunished. Also read, Honour Killing Report here.